Leeds City Council has announced the final detail of how it’s going to save £300,000 a year by cutting the hours its libraries are open to the public. Proposals going to council bosses for rubber-stamping at a meeting next Wednesday (15th October) say that 13% of library opening hours are to be cut citywide (I make it 12% – see below). The council says the cuts have been targeted at times when demand is at its lowest, and that over 98 per cent of users will be unaffected. It says the alternative – such as axing more libraries (13 got the chop in 2011), stopping the mobile library service or not buying new books – would have a greater impact on local communities. The £300,000 savings will be made through reduced staff costs. A report drafted for the meeting says that the original proposals on where opening hours would be cut library-by-library have been modified in light of a public consultation this summer in which over 7,200 people took part. In the consultation, users were asked which of two options for reducing hours at their local library they favoured. There wasn’t a “neither of the above” option. Little surprise then that only 4.6 per cent of those who responded “indicated that they had a preference for neither of the options presented which suggests that they felt there should be no reduction to library opening hours”. Consultations, eh? Dontcha just love ’em. West Leeds – where there was a vocal campaign against any reduction in opening hours spearheaded by local MP Rachel Reeves – has come out of the process pretty much unscathed. 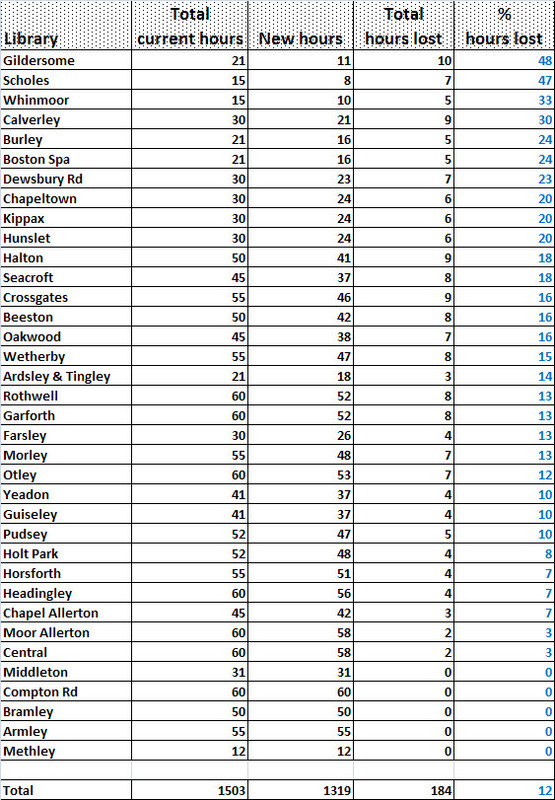 It’s been decided since the consultation that the library in Armley is one of three of the city’s 36 that are going to be exempt from the cuts, because they’re participating in a pilot of a new council plan to develop “community hubs”. And Bramley – which was facing closure all day Thursday – could end up with no cuts too after a local group proposed holding a “schools and community day” at the library. Mystery still surrounds the fate of the city’s least used library, in Methley, which, for some reason, wasn’t part of the consultation. Latest figures show it was only getting 80 visitors a week last year. “In the short term the opening hours will remain as current. Planning with the councillors for the longer term future of Methley library is ongoing,” the report says rather ominously. 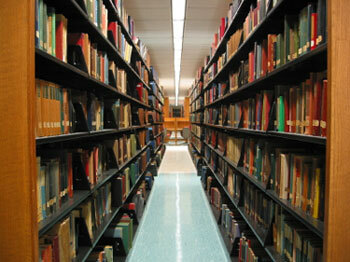 Below is the final list of how many hours your library is going to be cut. If you want to know the detail of the changes (what days, times are affected), they’re half way down the page here. 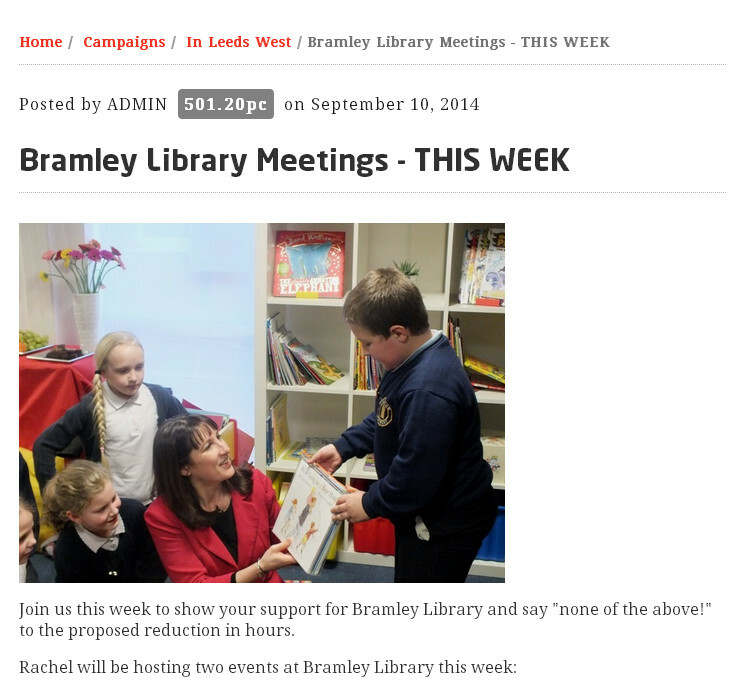 This entry was posted in Uncategorized and tagged leeds, leeds city council, libraries, Methley, rachel reeves mp, west leeds. Bookmark the permalink. If I remember correctly there was no clear option in the survey to state that neither option was preferred. It was presented as a choice between two sets of reduced hours with an additional comments section so it is no wonder their findings show on 4.6% supported no reduction in hours. Also I suspect many of the hours that are now being cut were introduced as a sweetener during the last round of library closures. Uncontrolled immigration, rising rents and house prices, stagnant wages, rise in radical Islam, another foreign war, huge budget deficit…. …but hey, at least our lovely Rachel is worrying about the libraries. Thank goodness for that. Leeds City Council should clamp down on its moonlighting staff who their HR dept or managers don’t seem to want to tackle. Its disgraceful how some people are milking the system and have been getting away with it for years, even taking sick days off to run their own shop!!!! But have the managers done anything? NO! I wonder how LCC can moan about budgets when there are so called admin managers getting away with this.